Dr. Janice Willis is Professor of Religion at Wesleyan University, USA. 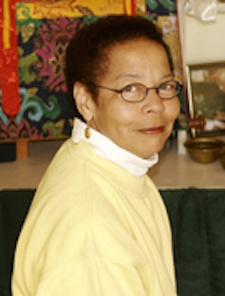 One of the earliest American scholar-practitioners of Tibetan Buddhism, Willis has published numerous essays and articles on Buddhist meditation, hagiography, women and Buddhism, and Buddhism and race. Professor Dr. Janice Willis has authored several books, including: Dreaming Me: An African American Woman’s Spiritual Journey (2001). Willis also is the author of The Diamond Light: An Introduction to Tibetan Buddhist Meditation (1972), On Knowing Reality: The Tattvartha Chapter of Asanga’s Bodhisattvabhumi (1979), Enlightened Beings: Life Stories from the Ganden Oral Tradition (1995); and the editor of Feminine Ground: Essays on Women and Tibet (1989). Jan Willis (BA and MA in Philosophy, Cornell University; PhD in Indic and Buddhist Studies, Columbia University) is Professor of Religion at Wesleyan. She has studied with Tibetan Buddhists in India, Nepal, Switzerland and the United States for more than three decades, and has taught courses in Buddhism for twenty-five years. She is the author of The Diamond Light: An Introduction to Tibetan Buddhist Meditation (1972), On Knowing Reality: The Tattvartha Chapter of Asanga's Bodhisattvabhumi (1979), and Enlightened Beings: Life Stories from the Ganden Oral Tradition (1995); and the editor of Feminine Ground: Essays on Women and Tibet (1989). One of the earliest American scholar-practitioners of Tibetan Buddhism, Professor Willis has published numerous essays and articles on Buddhist meditation, hagiography, and women and Buddhism. Dreaming Me: An African American Baptist-Buddhist Journey. (2001). She enjoys NFL football.